Hydrogen bonding is an electrostatic attraction or force which is always present between a partial positive hydrogen atom and a highly electronegative atom such as between hydrogen and oxygen or hydrogen and fluorine etc. Hydrogen bond is comparatively a weak bond and always denoted by a dotted line.Hydrogen bonding is present in those molecules only which have hydrogen atom and highly electronegative atom such as fluorine chlorine oxygen and nitrogen etc. A hydrogen bond can be break by providing the amount of energy about 25-30 kj/〖mol〗^(-1) to it. 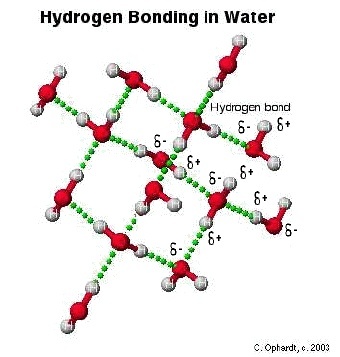 The hydrogen bond has the strength about twenty times less than that a covalent bond.Which means a covalent bond is comparatively very strong bond with respect to hydrogen bond.The molecules of hydrogen atom and fluorine atom are bonded with one another in a zig zag manner.Also the hydrogen bond is always stronger than simple dipole-dipole force.Hydrogen bond has many properties and applications.In hydrogen bonding it is necessary that partial positive atom will always hydrogen as the name of bonding shows hydrogen bonding.But partial negative atom may be any highly electronegative specie . 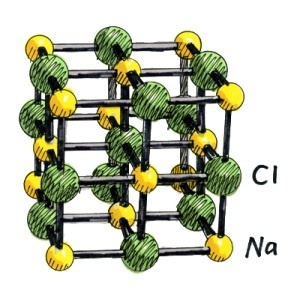 A crystal of sodium chloride Contains a face centered cubic (F.C.C) Shape.Each sodim ion is surrounded by six chloride ions and similarly each chloride ion is surrounded by six sodium ions.The distribution of both the ions is in the way that sodium ions are placed at six corners of the octahedron and the chloride ion is placed at the centre of this octahedron and these joined to one another and in this way form a huge structure.The distance of all chloride ions fom one sodium ion with which they are directly attached is same but both the sodium ions and choride ions are not joined to one another by pairs.Any independent molecule does not exist in the structure of sodium chloride.But in vapour phase of sodium chloride it is possible that an independent molecule of sodium chloride can exist.In the structure of sodium chloride it is clear that Eight chloride ions are present at the corners of cube.Eight cubes are attached with each chloride ion.Each unit cell contains four sodium chloride units.A distance of 5.6A^0 is present between two nearest same atoms which is necessary and the distance of two adjacent ions of different types or kinds is 2.815A^0.